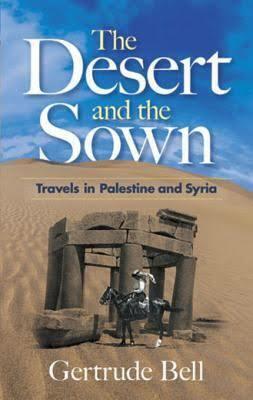 Originally published in 1907, The Desert and the Sown tells the story of Gertrude Bell’s journey from Jerusalem to Alexandretta in Syria. Gertrude Bell is an unusual Englishwoman. One of the first to graduate from Oxford she was a formidable historian, archeologist and linguist, speaking Persian and Arabic among other languages. For most of the journey she can talk to the people she meets without need of translation, moving between people of different origins and religion and between men and women with the ease of an outsider, something it must have been much harder to achieve in England. Because of her ease of movement and linguistic ability she learns a great deal about the politics of the lands she travels across and thinks hard about the Ottoman Empire and the rule of the Turk. She also spends much time on the ruins of previous eras, Greek, Roman, Syrian. Despite her broad outlook there are dated opinions that make a modern ear wince. In the preface she writes that ‘The Oriental is like a very old child’. However, her ability to capture the beauty of travel, both the barren solitude of the desert (though it often seems less lonely than you might imagine: ‘The Arabs do not speak of desert or wilderness as we do. Why should they? To them it is neither desert nor wilderness, but a land of which they know every feature, a mother country whose smallest product has a use sufficient to their needs’ p60) and the delights of old towns put to modern use as well as the sheer excitement of stepping beyond your normal confines into ‘the immeasurable world’ where ‘an unanswered question and an unanswerable doubt [lie] hidden in the fold of every hill’ (p.1) are enticing. She is also open-minded, for someone of her birth and time. She says of the Druze (those who follow the Druze religion), ‘Cruel in battle they may be – the evidence against them is overwhelming; some have pronounced them treacherous, others have found them grasping; but when I meet a Druze I do not hesitate to greet a friend, nor shall I until my confidence has been proved to have been misplaced’ (p310). One of her caravan, travelling through the desert with her, insists that her book be more than a map and list of archeological sites, but also offer practical travel advice such as where supplies are hard to find. I wonder also whether other travel narratives of this time would give the same space to stories told by fellow travellers on the road. There are blood feuds and accounts of religious mysteries, mothers crying over distant or lost sons. There is also much poetry. I’ll admit that this isn’t always an easy read – the language can be as convoluted as beautiful, and sometimes the descriptions of ruins can feel repetitive – but it is an enlightening one. The stones of ancient structures are repositioned into (then) modern homes whose explanations make clearer the history of an area of the world with which I am mostly unfamiliar. Next week I’m reading Written on the Body by Jeanette Winterson.